David Ige, the governor of Hawaii, recently approved revised rules for the state's rabies quarantine program for dogs and cats that enter Hawaii . Hawaii, the only rabies-free state in the U.S., has maintained its rabies-free status by a robust quarantine program for arriving pets. As the governor stated, "It is vitally important that we protect our state from the introduction of rabies, not only for animal health, but human health". Under the revised pre-entry requirements, two waiting periods of the "5 Days or Less" program have been reduced: the times between the Rabies Antibody Test (FAVN) and arrival in Hawaii, and between the 2nd (and most recent) rabies vaccination and arrival in Hawaii. The state of Hawaii engaged EpiX Analytics to conduct a quantitative risk assessment and evaluate how the proposed reduction in waiting periods affected the risk of rabies introduction. The study provided valuable information that gave officials the confidence to move forward with revising pre-entry requirements that would not compromise the success of the program. 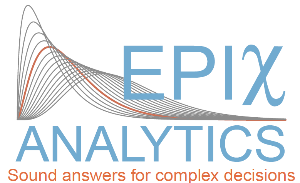 EpiX Analytics is hosting a pre-ISVEE Symposium Workshop entitled Modeling food safety and animal health risks using R.
The workshop will take place on November 10-11, 2018, at the Empress Convention Centre in the Empress Chiang Mai Hotel, Chiang Mai, Thailand. There are still a few spots available to register for the workshop. The fee for students is US$ 650; for non-students US$ 800. Dr. Huybert Groenendaal will give a presentation entitled, Financial Analysis of Projects: Good practices and common mistakes, at the Palisade's 2018 Risk Conference to be held in San Diego, CA on Nov. 15-16. His presentation will occur on Nov. 15 at 11:20 am. Stop by to get exposed to practical modeling tips with an emphasis on financial evaluation through real-life @RISK models. Dec. 3-6, 2018 Quantitative Risk Analysis with R , Ft. Collins, CO, U.S.
Feb. 27- Mar. 1, 2019 Corporate Finance Risk Analysis, Boulder, CO, U.S.
Apr. 3 - 5, 2019 Quantitative Risk Analysis, Boulder, CO, U.S.
Apr. 29-30, 2019 Intro. to Quantitative Project Cost & Schedule Risk Analysis, Boulder, CO, U.S.
May 20-24, 2019 Quantitative Risk Analysis and Disease Modeling in Epidemiology, Ft. Collins, CO, U.S.